Higdon Furniture is one company of furniture design and furniture sale.It has many years of furniture B2B Outlet&Export,their furniture most in modern&contemporary styles,Export to many countries all over the wolrd. Outlet Furniture Items contain dining room furniture,office furniture,living room furniture,bedroom furniture,patio&outdoor furniture,in special the dining chairs outlet and the office chairs export are most and well popular. Higdonfurniture.com is the B2B Furniture sales online store,at here you can choose your mind furniture,the website furniture update along,you can find the best selling furniture design in affordable price. 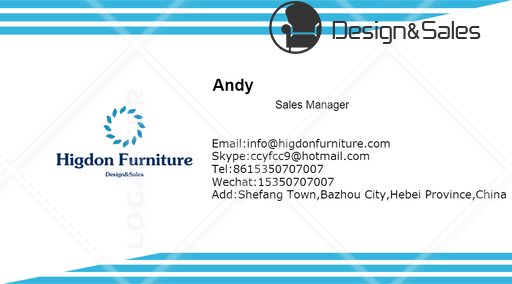 If you want to do furniture trade business or has been do furniture import from china,Higdon Furniture is a good partner.Furniture in good quality,sales in best service,fast delivery and shipping,mainly the cheap price. Notice:We Main Do The Wholesale Business,So We have Minimum order quantity,mostly at least 50 pieces.